If you’re a paddler from the Clearfield or Cambria Counties in Central Pennsylvania you’ve probably paddled the Clearfield Creek, but what’s interesting is that many paddlers haven’t heard of the Clearfield Creek because it’s often referred to as the Madera Creek, Faunce Creek, or the Glen Hope Creek, and occasionally confused with the Little Clearfield Creek. The Clearfield Creek is popular because it’s one of the few paddling opportunities in the Clearfield and Cambria County region. The headwaters begin near Ashville, just above the Prince Gallitzin State Park, and the creek flows through many small towns such as Coalport, Irvona, Glenhope and Madera before meeting the West Branch of the Susquehanna near Clearfield, Pennsylvania. The creek is also fed by many tributaries, the largest feeder is the Glendale Dam at Prince Gallitzin State Park. In a region of few creeks and rivers, and a paddling season that often ends by mid June, this creek offers a fun class 1 paddling experience, with a few fun riffles and obstacles here and there, it’s perfect for a short relaxing day trip; however, during times of flooding this tame creek does carry a strong current that could pose a problem to the inexperienced or unaware paddler. 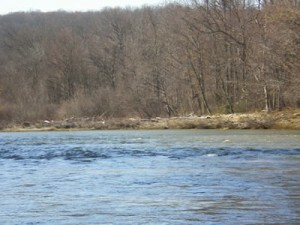 There are several popular paddling sections on the Clearfield Creek. While it’s entirely possible to do an extended trip from Coalport to Madera, Madera to Clearfield, or even Irvona to Clearfield, this creek is best paddled as a short day tripper. 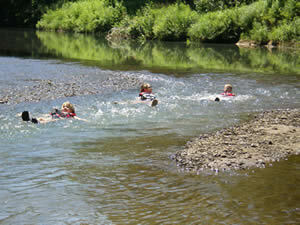 The most popular sections of this creek are Glen Hope to Madera, and Madera to Faunce. This is the longer trip at six to eight hours of paddling depending on the speed of the current and how much playing around you do. It’s also a flatwater section that some of the locals avoid due to its slower current, but it’s popular for 1st time solo paddlers or younger paddlers in recreational kayaks. And as you can see in the photo there are interesting places to get out and explore. Keep your eyes open for a beach on river left that used to be the location of the Lions Club swimming hole. 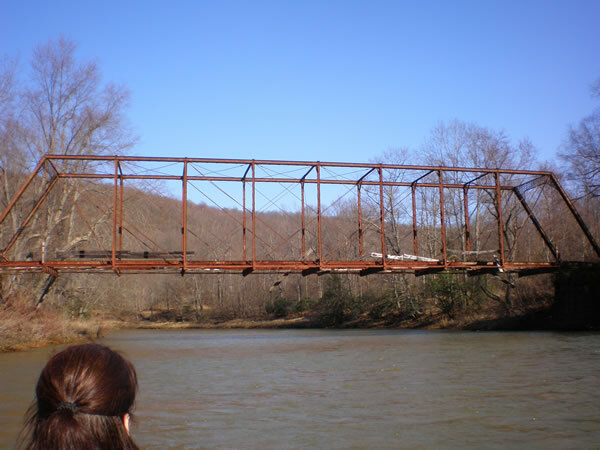 The swimming hole was closed in the early 1970s but you can still see remnants of the concession stands that once occupied the area. 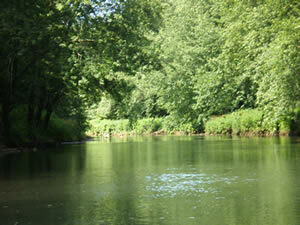 And if you are into canoe camping there are a few places to pitch a tent, although there are no established campsites. Also be aware that most of the property along this creek is private property, so tread lightly. This is the most popular section because of its faster current and it’s winding path through some of Clearfield County’s remote woods. On this twisty section you’ll enjoy a slightly faster current, occasional obstacles and fun riffles and eddies, and you’ll enjoy some of Central PA’s scenic views that take you past remote villages and few campsites. And if you look closely you’ll see evidence of early homes, industry, and even a once major travel route during the 1800s that eventually succumbed to time. I recently read an Internet article written by a paddler who claimed the Clearfield Creek was a pristine river flowing through remote Pennsylvania wilderness. Well, this creek is far from that. Although it does carry you through remote areas of Clearfield County, it is far from being truly remote. During your canoe trip don’t be surprised if you encounter groups of four-wheelers, dirt bikes, or even a group of good ol’ boys target shooting on a Saturday afternoon. And one thing you will not encounter are fisherman, because the majority of this creek is not pristine and you’ll see much evidence of that when you paddle past the multiple acid drainages seeping into the creek. Paddling the section Glen Hope to Madera is an easy shuttle because the creek winds back and forth parallel to PA – 53 N, from Glen Hope to Madera. You can begin your canoe trip at the Caldwell Memorial Park and end your trip at the old Madera ball field where you will find plenty of parking. Your shuttle on this trip will not take longer that 20 minutes, just drive PA-53 N from Glen Hope to Madera and turn into the ball field on the right side just before you cross the bridge in Madera. On the section Madera to Faunce the vehicle shuttle is slightly off the beaten path. You’ll unload you canoes at the Madera ball field and begin your shuttle up PA- 53 N, then to PA-453, then left to Sanbourn Rd, then onto Faunce Rd. You’ll park your vehicles at the Faunce bridge where you’ll be exiting your canoe on the river left. I’ve created a Google Map for you. The water lever of this creek can rise and drop quickly, and the best time to canoe it is during the spring; however, you will find that it’s sometimes possible to paddle after a hard rain during the dry seasons or during occasional releases from the Glendale Dam. Camping on this creek is very limited, and on some sections nonexistent, so I’d suggest not camping as you will certainly be pitching your tent on private property. 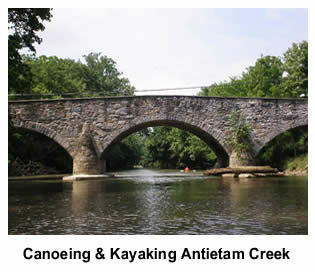 we paddled the section from Flinton to Coalport (Mill Street bridge behind firehall) yesterday 5/20/12. Was a nice trip but there is a pretty good hazzard midway between the 2 places that involves a lot of big trees and logs down across the water. It is a little rough (rapids, rocks, wood) getting through the single narrow passable opening. You may be better off pulling out and by passing it on land. Otherwise we did encounter a couple low spots but most were still passible. No heavy rain in the area for about 1-2 weeks now. Overall it is a pleasant and easy paddle.